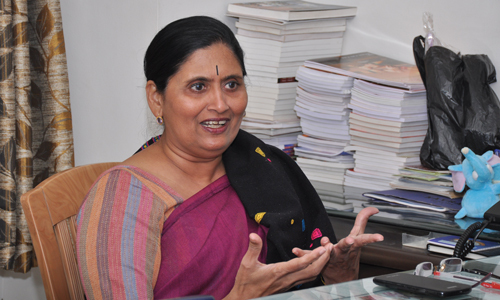 Dr. Medha Purao Samant, is one of the best known figures in the areas of Financial Inclusion. She has many accolades to her name, “Entrepreneurs International Award for the year 2003”, “Women Leaders in Microfinance”, by Indian School of Microfinance for Women, “Adishakti puruskar” by the hands of Dr. Kiran Bedi. The most recent being Microfinance India Award by Access Assist, in the category of Community Owned Microfinance Organization of the Year 2014, but for her customers and her employees, she will always be their ‘Medha Tai’. Born to a family of social activists, Medha Tai was always inclined towards the cause of ‘banking for the poor’. One day she decided to formally end a 12 year old career in a commercial bank and devote her life to the cause. She along with 9 other women, who were her first customers, wrote the story of Annapurna Pariwaar. Today Annapurna is a group of 6 Non-Government organizations working in Mumbai and Pune for the urban slum dwellers, with a vision of empowered women in a sustainable family. Shini: What was your inspiration behind starting the microfinance unit? Was it your parents, both of whom were widely known social activists? Or was it story of common women like Shavantabai & Laxmibai who inspired you? Or was it anything else? Dr. Samant: You know, inspiration is not a one day thing. It does not happen suddenly. It is a long process. It depends on how you are bought up and also how your thought process is shaped along the way. You develop a liking for something. You think about it day in and day out, it becomes your passion. Money becomes not important. You also need a comfort level that this would be something you plan to do for the rest of your life. It was the same that happened with me. I was working for a commercial bank for 12 years. I always knew that banks are not doing what they are supposed to do. In the recent years, Reserve Bank has been talking about Financial Inclusion, few years back the term was Priority sector lending, much earlier it was called mass banking. It is the same old wine in a new bottle. Every 10 years they package it differently. The ideology behind it remains the same, to provide financial services to masses. Anybody who is poor would also need the same financial services like you and me. They need loans for business expansion, savings service to save their small savings. They need insurance coverage for health, life, family, assets and they need pension. The poor also have many other needs that are non-financial. All of our projects come out of that understanding that poor will need all these services. This is not just a dry loan program where I give a loan and you repay it. I come from a family with a strong social orientation; both my parents are social activists. My husband too is from a social background. So I always had a very supportive environment around me. Most of our discussions at home were around these subjects. That was one of the factors, at the other end; my banking job was also leading to frustration. Not that I was personally unhappy. It was a very rewarding job, it paid me well and at my designation I was entitled to many other benefits. But I always felt that we were not reaching out to the poor. Our customers were well educated elite people, who could walk in and dictate their terms. The vegetable vendor just across the street was still borrowing from the money lender. Everyone could see that. I too saw it but I also understood their reality of life and tried to help them. That was the only difference. Shini: Like you said you quit a lucrative career at the bank to pursue a social cause; you took this decision barely in a couple of months. What was the impetus behind this courageous step? Dr. Samant: It was an easygoing life, it offered utmost comfort. Today banking has also become a very demanding field, but that was 23 years ago, banking job was not all that demanding. Though, I had quit in a couple of months after the first loan, but actually the decision making process had started much earlier. The thought of ‘Banking for the poor’ was always brewing in my heart. I had also discussed with my family about my decision to quit the banking job and devote whole of my life to the poor. Microfinance was nowhere in the see then. It was 23 or 25 years ago. It was never a sudden decision, for the external world it looked like that, but in my mind I was always planning. For others it came like, you just started giving loans and in a few months left the bank job. It wasn’t that, it was actually just a trial; it was a test of group solidarity amongst these women. We initially started with a group of 10, one dropped right at the start; we had to suffer an initial set back. But luckily the rest of them continued and took the responsibility for each other. After the set period of 50 days, we were confident of each other. I was confident enough that this model will succeed. It was just a validation. The decision was already made a long time back. Shini: People challenged your thought process at every step, whether it was doing microfinance or choosing a cooperative structure of operations, what was your source of confidence? Dr. Samant: [Sighs] One of my board member was like, ‘Ohh my God! what are you talking’. It was a time when there was high tide of microfinance, everyone was talking about NBFC, and Co-operative structure looked very unwise. It was a time when Indian Overseas bank was ready to invest 5 crores with us and our portfolio was only 3 crores. It could have been a NBFC joint venture. It was then when I said no to the joint venture and strongly stood behind my decision of opting for a cooperative structure. I had to convince my board members which took me a lot of time. One thing that helped me a lot throughout the way was that I used to read a lot, I use to research a lot, now my eyes do not permit me for voracious reading, but 10-20 years ago, I read a lot. I read about the RBI guidelines, I read about cooperative laws, I also read many a things about the NBFC structure and what were the loopholes etc. I learnt from my father, to study everything, all the pros and cons of any decision before jumping into it. My mother has the heart of an activist; she first listens to her heart and then her mind. I think I have got the qualities from both my parents. Some of my decisions look very quick, but I would have deeply studied and researched well. I knew NBFC model had flaws. NBFC could not generate money from poor people’s own funds, so you lose out on an opportunity to collect that small thrift and pool up a fund. NBFC do not have a recovery clause and another weakness was that NBFCs will be perpetually borrowing from others. So these were 3 flaws I carefully thought about and came to a conclusion. I also consulted some very senior bankers from the field. My father’s friends who treat me like their own daughter, therefore, I also collected various expert opinions. Like one of the thoughts from Shiv Khera ‘leaders do not do different things they just do things differently‘. I am not saying that I am a very great leader but I think I am a considerably good team leader, and as a leader you don’t think what the current trend is, you think about what would be the best for all. As time progresses, the world realizes the impact of the decision and appreciates why that decision was important at that point of time. Whenever I have taken a call of my heart I have backed it up with thorough research and study. Thankfully all the trustees, board members showed enough trust in me and allowed me to go ahead with whatever I thought was correct. Shini: Tell us the story of the magic money. Dr. Samant: Money is money. Good proper investment at proper time and at proper rate is what everybody wishes for. But the difference in the case of the poor is that they are not only poor they are also illiterate. So for them it is magic. There were nine women who borrowed from me. That was a fifty day cycle, everything I would ask them, like ‘chalo group banayenge kya, after a one and a half year long discussion they said ‘chalo banate hai’ any they pulled up 10 women, one dropped out, now there were nine women. They said okay now we will hold each other tight. I wanted to lend them on their own terms, but they were only exposed to the loan patterns as of the local money lender, Anna. So if I asked them how much loan would they need ‘loan kitna chahiye,’ they said “1000 rupees that is sufficient for us.” How will you repay? 25 rupees each day, because Anna does it that way. They were never aware of the interest they incurred in the whole cycle. I just did it as an experiment. We were closely interacting every day. It went on for 50 days and by the end of 50 days the amount was 1250, the loan I gave them was 1000 rupees. Out of the 1250, I kept Rs.50. I said this is a service charge. I did not even want to call it as interest. I explained to them how these 50 rupees each could help us hire employees or other related expenses. And the savings of Rs.200 would be for them. It was then when they said, it is the same amount we paid to you for the same 50 days as we paid to Anna then how do we have these 200 extra, your money is magical. I explained to them. ‘This is our money, you have to preserve it. It is our capital.’ For me those words were magical. When you say it is mine people do not have ownership, when you say it is ours anybody and everybody would protect it. There on, every time they included a new borrower or member, they would explain to the new member everything, things like you cannot skip installment, this is our money, and if you don’t pay we will sit in front of your house. It was simple arithmetic. 50 rupees is not a small amount if you put aside that as a capital, a group capital then you build on that. It was a good experiment. For them the money was magical, for me it was the thought which was magical. Shini: Like you just mentioned, it has been old wine in a new bottle, whether it is called financial inclusion or mass banking. Given the new reforms in the sector, what do you think how much of a role microfinance can accomplish? Dr. Samant: MFIs have a very big role. Now most MFIs are turning into banks. Though I have not deeply studied the structure, still I feel that if you turn into a bank you will be doing limited microfinance and three or four limitations will be always pertinent. Banks have SLR and CRR conditions to be met. So 40% of the funds will go towards SLR and CRR, even if those limits are a little relaxed, it will still be around 35-40%. Still you will have only 60%. Banks are not allowed to give unsecured finance. Only 15% of the portfolio can be unsecured. Then Microfinance portfolio will be limited to 15%. Therefore, I feel that any good MFI should not turn into a Bank. This is purely my personal opinion, because if they turn into a bank then you will move away from the goal of financial inclusion. At Annapurna, till this moment it is our decision that we don’t want to become a bank. I don’t know tomorrow what new changes could come in but I am sure we will be able to accommodate those changes and be able to include the society. Microfinance means finance for the poor. We should not have our own goals. The banks or the cooperative banks cannot reach out to the poor by the very structure. Good MFIs I think can be good cooperative societies, so the structure by itself becomes more conducive. Shini: Annapurna facilitates its customers and other women in the society with some very interesting awards like successful entrepreneur, best mother and social achievement award, even the best father award. What is the motive behind such awards? Dr. Samant: You can never forget that we work with the very poor women, who are never appreciated by their own families and the close-knit society they live in. Who will look at her and say ‘Ohh!! My God she is a very good mother’? Everyone is busy with their own daily struggles of life. And it is a deep seated wish of any human being that someone should appreciate. Someone should say ‘that you are doing a really good job’, it gives them a sense of pride. And when you appreciate and felicitate a few women in a crowd of 20000 women, you call them on the dais. They feel much empowered and looking at them, the others in the crowd are inspired and want to win it for themselves. Every year, after the AGM, around 1000-2000 women want to come and shake my hand and touch me, just look at me and say ‘tai we are so proud of you’. Next year I will win that award. I think that is a very big emotional need that we address here. Though we have a scholarship program where we cover single women, but there are so many women who are single who are struggling, there are some whose hardships never get over even after getting their daughters married. Sometimes, the husband would ill-treat the daughter or at times there are cases of sudden deaths, these daughters return back home. These mothers need to be appreciated. They feel empowered. Even men, in fact we have very few men borrowers. But even amongst them we have seen this category and it creates a huge impact. Let me share an experience. There was a male borrower, who was an auto rickshaw driver, his wife suffered from mental illness after her 3rd delivery. She died after delivering the 4th kid. He chose not to remarry. He faced a lot of hardships, he was doing many a thing for his children, but there were also times, when he also shouted at them, times when he resorted to alcohol. But still we chose to give him that award; he was so overwhelmed that not only did he cry on the stage. The same very night he called the LSO and branch manager spoke to them for half an hour and cried he repeatedly said ‘so far ever in my life no one has ever told me that you are a good father. At times, I knew that I was being a bad father. I yelled at them. I knew they were motherless, I feel bad for them but where else would I take out my frustration. Mera seena chouguna ho gaya hai’. We also have best entrepreneur award. They are good examples of how you can become a good entrepreneur. There is also a lot of social responsibility linked up with what they do. You are also creating job opportunities for others. All our members look at them as their role models. We also have social awards for women who go out of their way to fight against societal evils like dowry, inter-religion, inter-caste marriages, and remarriages – divorced or single mother. So those women are felicitated. Such cases are exceptional cases but they do exist in the society. We are not only just giving awards we are also creating a value system, encouraging inspiration. These small things go a long way in empowering people. Giving only loans is not empowerment, it is only financial empowerment but these activities help social empowerment. Shini: 99% of the employees in your organization are women. Some of them have been associated with the organization with as much as 19-20 years, how do you manage to inspire them and keep them so motivated? Dr. Samant: I feel that there is a slight difference between a women lead organization and a male lead organization. I consider Ilaben as my role model. The organization lead by her ‘SEWA’ is also very similar in these parameters. In a woman lead organization you create an environment and culture for women. It is professional, it is promising, still it is not that demanding, that their personal life takes a back seat. There are two roles every woman has to play. One is the productive responsibility and one is the reproductive responsibility. A woman has to split her life between these two responsibilities. Productive is the sphere out of home, professional satisfaction, but she also has to take care of her family. I think I have created a conducive environment at Annapurna. We do not hire MBAs, there are only MSWs. They want to have a professional life with a heart for poor. She Introduces me to Syamala, who heads the day care project, has been with the organization for 13-14 years. The project is her baby. She is happy doing it. She has an ownership feeling. Everyone is happy doing what they are doing and they have a work life balance. I treat my members with a lot of respect and I think that flows down. At Annapurna it is a total no no to shout at anyone or speak indecently. We have a lot of discussion and dialogue so everyone feels very responsible. Everyone has a set role communicated to them from the start. They have a 30 day planning. I always seek opinions from my members, if we could do something this way or that way, then together we decide what we want to do. My father always spoke to me in that way. He always treated us with a lot of respect. He just showed us the pros or the cons of any decision and left the decision to us. That way we were always responsible for our own actions. It is a personality trait of an individual, but as they have been with me for long, so they may have picked up things on the way. They are always a part of decision making. I think these things could have kept them involved. Shini: Transparency is one of the values that you have clearly communicated as an important value for an organization or business model, what are the others according to you? Dr. Samant: Democracy. It is at the core of everything. Whether it is your customer or your employee or any other stakeholder. At Annapurna, each one has a vote, no one can hold a share worth more than 10000 rupees. Voting opportunity remains the same for anybody. I feel though India has superficially accepted the democratic principle, but in our heart we still like dictators, who tell us what to do. I was born and bought up in a democratic atmosphere and I feel that given a choice every human being will take a wise decision and if you have democratic principles at your heart, you know that everyone is equal and everyone is entitled to the same respect. So those are at the very core of Annapurna. Everyone is well respected and no one, irrespective of their designation or experience, is looked down upon. I really get upset if I hear anything like that. I have always insisted that I will not have a closed door cabin. My room is not air-conditioned because my LSOs are all working in the slum. Even at Annapurna, the first office was in my house and we had an office under a tin roof and I used to sit under the tin roof. There is openness, openness in accepting each other’s decisions. If your goal is set like I want to do so much turnover, this much target then the purpose gets diluted. At Annapurna, there are benchmarks set for each LSO but they decide their own targets. These targets are also evolving. Therefore Ownership also becomes an important value. Shini: Annapurna Pariwar has a holistic approach catering to the needs of women at the lowest strata of the society. There is microfinance, there are Day care centers, and there is health insurance, savings, working women hostels, micro insurance, and education scholarships. Are there any future plans? Dr. Samant: I have no future plans, none of these things I had planned. This is as and when it came forth. I don’t know if we have covered all the needs, I know that we have covered all the needs expressed by our customers. We have covered most needs which were doable. Some of the needs were also like, you take us to a pilgrimage. We said we have given you enough confidence now you can go ahead and organize a group of 50. We have not addressed those needs that could be addressed by them on their own. Practically speaking, I have no plans for the future. But I do not know what need could arise in their situations in the future. I only know that I have created a conducive environment where we listen to our customers when they express something. I accept that this environment was institutionalized, systems and structure, were put in place by me, we did create channels of communication from top to bottom. For members there are community meetings, community representative meetings, AGM, Board Meetings where there are customer representation. We harnessed the culture of listening. We listened. We listen very carefully. Even when they (customers) are not saying anything, they are saying something. Even your data and figures tell you that a particular scheme that members are not appreciating or moving away from. I really do not know what I or the organization will do tomorrow. Like Mahatma Gandhi said, “If I say something about any topic today and the same topic four years later, you should consider the latter one to be correct.” I just throw light on things; it’s not a plan for the future. It’s what the customers say and what the data has to say. I don’t know what my members will say tomorrow. If it is doable, we have enough resources we will do it. I am sure even after me I have created enough pool inside that they will continue to listen to the customers actively and take decisions jointly in a democratic way which will help the poor. Shini: Women’s day around the corner, do you have any message for the women? Dr. Samant: To be honest, Women’s day has become just a tokenism. I feel very sad about it. I do not feel like celebrating it anymore. My mother started Annapurna in the year which was celebrated as an international women’s year on the women’s day. 8th March 1975. Many people do not even know the background of Women’s day. It started in USA, when a group of women working as tailors demanded equal rights, work hours and fixed salary. Then it slowly percolated to Germany. But today it has taken a different meaning. Every day in society should be everyone’s day. Every day we should care for men, women, children, senior citizens, animals and environment. It is a world where everyone should peacefully coexist. We all need each other and it is also essential for the ecosystem. There should be an egalitarian society where everyone is happily living. I feel that every day, all 365 days, should be this way. Though a woman is the central point and the connecting dot but everyone in the family should also be happy. Despite 20 plus years of international banking experience I was a novice to Microfinance back in 2008. I was entrusted with the startup of the Ujjivan business in the Western India. Samit e-introduced me to Dr. Medha Purao Samant, a widely acclaimed livelihood practitioner and pioneer in bringing Microfinance to the slums of Mumbai and Pune. 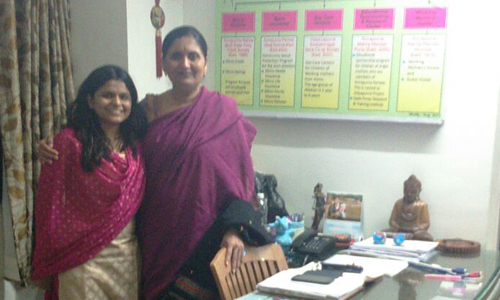 It’s been 7 years since the first meeting with Dr. Medha Samant, for me a memorable one. Armed with many questions, and a sense of uncertainty about what I had set out to achieve I visited the Annapurna office at Warje, Pune for my scheduled meeting. I could not assume anything in my effort to try and understand as much as possible about the customer segment Ujjivan was committed to serve. Personally, I knew little about the segment and even less about the challenges that I was likely to face in this endeavor I had committed myself to. Dr. Medha assiduously answered each of my questions and as an earnest student, I imbibed all the knowledge from her experiences, knowing how valuable each of her sharing was. She had me to speak with her colleagues who shared their processes and experiences with me freely. My next meeting with Dr. Samant was when I was invited to speak with a group of NGO MFI practitioners in Pune. Ujjivan at that time had a small presence in Pune with a few branches. It was enriching experiences for me to meet and engage a bunch of enthusiastic professionals committed to the cause of working for the underprivileged. It also was my first view to the diversity of thought among practitioners who served the underprivileged on what might be the best alternative. My discussions with Dr Medha helped me appreciate that solving an issue as large as that of ‘poverty alleviation’ required many models to be explored simultaneously. I am in debt to Dr.Medha Samant for helping me contextualize some of my early thoughts on a customer segment I had limited insights on, and freely sharing from her many experiences.